(Michael Barnes, Liberty Headlines) A day late and a dollar short, several GOP senators are making an eleventh hour push to fund President Donald Trump’s border wall — almost two full years after Trump took office. “President Trump has called for a border wall and I agree,” said Sen. Jim Inhofe, a senior Oklahoma Republican and chairman of the Senate Armed Services Committee, on Wednesday. 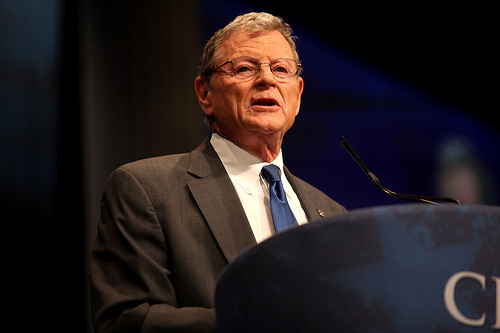 Inhofe was joined by U.S. Sens. Mike Rounds of South Dakota, John Kennedy of Louisiana and Ted Cruz of Texas, who together introduced the WALL Act, or legislation that would fully fund a border wall along the U.S. southern border. The legislation is the first actual bill that would fund the much discussed wall while identifying specific funding sources. It is also essentially dead on arrival given the Republican-controlled Congress has just days before the holiday recess. With all spending legislation required to originate in the House of Representatives, and Rep. Nancy Pelosi slated to become the next Speaker of the Democratic-controlled House in January, the WALL Act isn’t going anywhere. Pelosi said on Thursday that wall funding has no chance of advancement. But that didn’t stop the self- congratulating rhetoric by the Republican bill sponsors, although introducing a meaningless bill is more than the GOP congressional leadership has done. “The primary responsibility of the federal government is the defense of our nation, which includes strong border security,” Rounds said. “I have long called for building a wall as a necessary step in defending our border and stopping the flow of illegal immigration into our country,” said Cruz. But the proposal does list some interesting funding sources that could serve as a roadmap in future negotiations. Among the leading ideas, is increased financial penalties for illegal border crossings and visa overstays, and closed loopholes that allow illegal aliens to receive federal benefits. “By funding the wall through increased fines, we prevent any risk of dipping into Department of Defense funding, which is already stretched thin,” said Rounds. Kennedy said that tens of billions of dollars could be raised for the wall simply by clamping down on welfare benefits for those who should not even be in the United States. “Sen. Inhofe and I are teaming up on legislation that will save taxpayers $33 billion simply by ensuring that the taxpayers’ generosity isn’t wasted,” Kennedy said. According to Census data released this week, 63 percent of non-citizen households are on welfare, with half of them being in the country illegally. About 45 percent of all non-citizens currently receive food stamps, and more than half receive free health care through Medicaid. Eliminating even a portion of those figures would go a long way toward funding Trump’s coast-to-coast border wall which has been estimated to cost $25 billion. Another significant item in the legislation would require work-authorized Social Security numbers for illegals in order for them to claim refundable tax credits, which amounts to a taxpayer-footed boondoggle for illegal foreign workers. Currently, only the child of an illegal needs a SSN, not the parent benefiting from the a refundable credit.